Cast: Song Kang Ho, Byun Hee Bong, Park Hae Il, Bae Doo Na and Go Ah Sung. 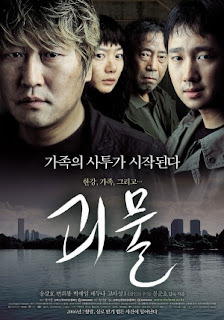 Park Gang Doo (Song Kang Ho), a mentally slow man and father of Park Hyun Soo (Go Ah Sung), runs a street vendor with his father Park Hee Bong (Byun Hee Bong), right next to Han River. On the day of his sisters Park Nam Joo’s (Bae Doo Na) archery competition, tourists sight a weird creature near the river. The creature, swimming closer to land, gathers the attention of most people, and soon enough also Gang Doo. While everyone is intrigued, the creature jumps out of the water, and starts grabbing and killing people. In the confusion Hyun Soo runs out, and becomes pulled underwater by the monster. The victims and survivors of the incident are evacuated, and the Park family, Gang Doo, Hee Bong, Nam Joo and the big brother Park Nam Il (Park Hae Il), gather to mourn Hyun Soo. The summary might seem detailed, but I managed to only cover bit of the beginning. If you are a variety or drama watcher, you will at some point get to hear about this movie, as it is referenced and mentioned a lot. So, I kind of needed to see what the hype was about. When I began it, I expected it to be a horror movie, but was pleasantly surprised of the fact that it is a monster movie (like Godzilla or like that). It’s been ages since I’ve watched one, and I really didn’t feel like another ‘The Wailing’. Of course, it has horror elements, where you get freaked out, but it’s more of a rescue mission or/and “clear image of the enemy”-kind of movie. I like the cast, and I like that the movie didn’t succumb the “American/Hollywood”-hype, though I disliked the beginning - where an American is to blame for the creation of the monster (don’t worry the first 10min of the movie shows this, so not really a spoiler). I don’t want to comment that much, as this is a movie classic, where my opinion can change your judgement. So, I’m leaving it with this: a good movie with deserved reputation, though a few dislikable situations and I have to admit, weird backstory - I felt like the director sometimes took a bit of the intelligence of the audience for granted. But all in all, enjoyable.